Bootleg : "Live in Paris 1995"
The mighty, veteran band Simple Minds in 1995, returning to rousing, arena-form for a huge, enthusiastic Paris crowd. The new album was "Good news from the next world" - Bringing Simple Minds immense success with powerful songs like "She's a river", "Hypnotised" and "Great leap forward", all heard here. 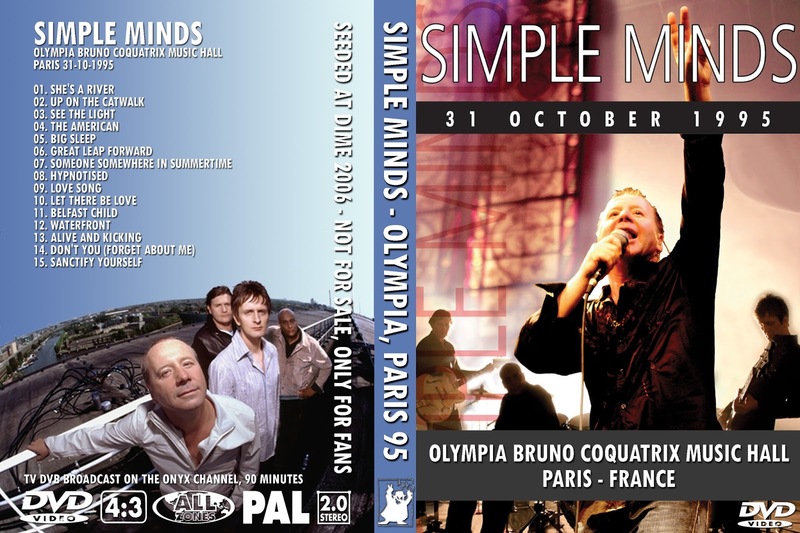 Vocalist Jim Kerr, with long-term partner guitarist Charlie Burchill, supported by a crew of the hardest-driving players in the Rock, brings to those and others numbers all the tireless passion and vocal intensity fans have come to expect from Simple Minds. Yet the band's breakout 1980's days are hardly forgotten in this concert. Propulsive, sophisticated, keyboard-driven arrangements of favorites from "See the lights" to "Someone somewhere in summertime" to "Love song" to "Belfast child" -along with an irresistible sing-along on "Don't you (Forget about me)"- bring out the best in the band drive the crowd into a frenzy.